Introducing the HP EliteBook 8570w In and Around the HP EliteBook 8570w Application and Futuremark Performance Workstation Performance Display, Battery, Noise, and Heat Conclusion: Fifteen Inch DreamColor, But Is It Worth It? We recently reviewed Dell's top of the line Precision M6700 mobile workstation and found that the overall design left something to be desired compared to HP's high end EliteBooks, but that the price was definitely right for the performance. The M6700 is likely to remain a good value for the enterprise sector (much as Dell's desktop workstations continue to be), and the 10-bit PremierColor display uses a similar LG panel to the ones HP employs in their DreamColor displays. Can we get something like that in a smaller form factor, though? As it turns out, theoretically at least, we can. We have an HP EliteBook 8570w on hand for review, and the 15.6" 1080p DreamColor display threatens to hit the sweet spot for productivity, with a smaller chassis footprint than larger workstations like the M6700 and EliteBook 8760w/8770w. But is the 8570w able to hit the same value propositions as Dell's mobile workstations, can it offer similar performance, or is our memory of the HP EliteBook line a little rosier than reality? The HP EliteBook 8570w is pretty much as high end as you can get in a 15.6" form factor; the only competition comes from Dell's Precision M4700 and Lenovo's ThinkPad W530, and unfortunately neither of these notebooks can be ordered with a 10-bit full gamut IPS panel like the 8570w can. Invariably someone is going to mention Apple's MacBook Pro, but it must be said that the MBP does not necessarily compete in the same markets as these mobile workstations do. If a user has need of a professional, workstation-class GPU, the MBP is immediately ruled out. With all that in mind, let's see how the EliteBook 8570w we were sent is configured. Dimensions 15" x 10.1" x 1.59"
Taking it from the top, the HP EliteBook 8570w is able to cram most of what you want in a mobile workstation into a slightly smaller form factor than the typical 17.3" monster, but there are definitely some sacrifices. While our larger Precision M6700 review unit could support Intel's fastest mobile processors, the 8570w is only able to go up to the Intel Core i7-3840QM, and our own review unit ships with the i7-3720QM. That chip sports a 2.6GHz nominal clock speed, able to turbo up to 3.4GHz on all four cores or 3.6GHz on a single core. The i7-3920XM and i7-3940XM and their 55W TDPs are just too much for this cooling system to handle, and you'll see even the i7-3720QM's 45W TDP can be a bit much sometimes. HP was able to include a healthy amount of memory and storage capacity, though. The 8570w includes four DIMM slots for up to 32GB of DDR3, and there's an mSATA bay to go along with a single 2.5" storage bay; the optical drive bay can also be converted to host a second 2.5" drive. Our review unit comes with 16GB of DDR3-1600 split between two vendors (oddly), but the mSATA bay goes unoccupied and we have to make do with a single 750GB 7200-RPM mechanical hard disk from Hitachi. HP is still behind the curve with mSATA; the only configuration option on their site is a 24GB caching drive. Handling workstation graphics duties, the 8570w's base configuration calls for an AMD FirePro M4000 with 1GB of GDDR5. The 1GB of video memory feels small for a workstation, but the M4000 is a 28nm, GCN-based part, the workstation equivalent of a desktop Radeon HD 7750. That means 512 GCN cores and a 128-bit memory bus attached to the GDDR5; the core itself is clocked at 675MHz while the GDDR5 runs at an effective 4GHz. Reviews of AMD's FirePro hardware are generally mixed, with drivers being the primary issue, but our review unit handled our benchmarks just fine and Maya users in particular will want to note that the FirePro can be a particularly good value. Moving to an NVIDIA Kepler-based Quadro K1000M (with slow DDR3 memory) adds another $100 to the price tag of the 8570w, and the K2000M (also with slow DDR3) adds $300. Connectivity on the 8570w is frankly pretty impressive. A total of five USB ports (two USB 3.0, one combo with eSATA, and one charging port), coupled with a 4-pin FireWire port, a full-size DisplayPort, and even an old school dial-up modem. Our review unit also enjoys a combo BD-ROM/DVD+-RW drive. Finally, the big selling point the 8570w has over the competition is the ability to upgrade to a 1920x1080, 10-bit IPS DreamColor display. This is something that will probably never not be worth upgrading to, although HP smartly includes a 1600x900 TN panel display as standard. DreamColor is a $525 upgrade, but on the 8570w it's plainly one of the best-looking screens I've seen on a notebook if not the best. 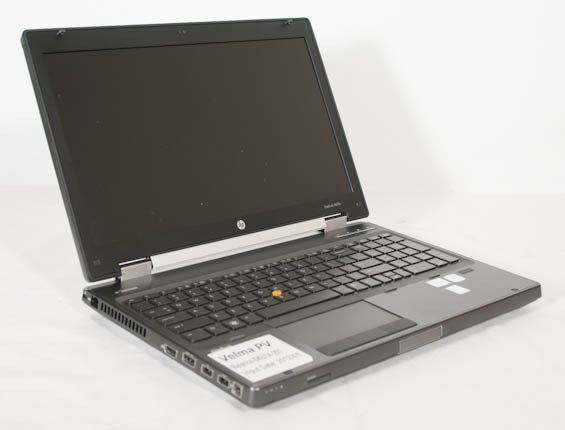 In and Around the HP EliteBook 8570w Introducing the HP EliteBook 8570w In and Around the HP EliteBook 8570w Application and Futuremark Performance Workstation Performance Display, Battery, Noise, and Heat Conclusion: Fifteen Inch DreamColor, But Is It Worth It? Yes, why? Personally, for me, his workstation reviews have lost a lot of credibility after his last farce of a review. I didn't like the Precision M6700's design. I felt like the EliteBook 8760w I had reviewed was a better built workstation. I still do. I can recognize that I was needlessly harsh about the M6700, though, and indeed folded information and feedback into this review. 1. Aesthetics. It's OK to comment on it but you make it sound as if others should consider your opinion on this issue when purchasing. As you said above, you thought the 8760w was better built and that's what we need to hear. Quality of materials and build. But try to keep in mind that other people don't have the same appreciation for HPs design as you. 2. "Standard" keyboards. Why do you consider HPs the more 'standard' layout? The layout on the Dell is the same as they've been using in the Latitudes and Precisions since 2001. Literally more than 10 years. HP on the other hand has switched during the EliteBook's short life. Interestingly, the first and second generation used the SAME keyboard layout as Dell. So I'd argue (and have evidence to support) that the current HPs are using a NON-standard layout. This is why we have issue with these reviews. You're making sweeping statements that aren't backed up by fact and you're using these to support your position. Have you addressed the lack of basic technical research regarding the Optimus system? This is critical in any informed discussion of these laptops. Optimus with an 8 bit screen makes for great battery life, but you do not get that wonderful IPS screen. Note that HP does not bother even giving you this choice due to their design. If you want IPS, FirePro, or HP you lose ~60% runtime. This would have taken almost no research to find out, and nowhere in any publications I have seen does it state that Optimus does not work with Quadro. This site has always seemed to be about having accurate information, even if the reviews were a little behind. Your reviews, and your unwillingness to acknowledge the errors in a timely manner (as Anand has done many times) are not in keeping with this sites reputation. What exactly are you asking for with regards to Optimus? From your statement, I suspect that you are already aware of the fact that Optimus is not supported on Quadro cards, just as it's not supported on desktop systems. What else is there, then, to say about the matter? The article clearly states that the use of the 10-bit panel precludes the use of Optimus. Optimus does work with Quadro cards - as demonstrated with Dells M4700 and W530 Thinkpads.